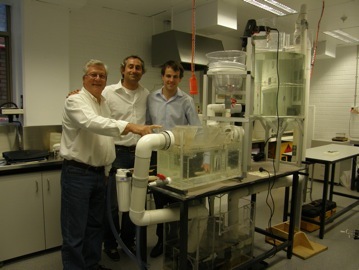 Retaw manufactures SDU – a world first Storm-water De-contamination Unit. When early testing produced some unexpected results, concerning contaminant removal, Retaw needed an expert on a short-term basis — so they contacted APR.Intern. Cate Ballard from APR.Intern knew that the new state-of-the-art Fluids Lab at the University of Sydney would be perfect to further design, test and optimise Retaw SDU’s operating parameters. So she matched honours student Scott Manning and his supervisor, Dr Maggi, with Leo Crasti at Retaw to tackle the problem. ‘It was my aim to coalesce the two programs so that a rigorous, in-depth analysis could be achieved. This way I was able to end my engineering degree with an industry-relevant application,’ Scott said. Scott constructed a laboratory model — see image below — to simulate the real-world conditions that SDU operates under. The ability to regulate the water flow rates allows different rainfall scenarios to be investigated and then, by varying the concentration and type of contaminants SDU’s efficiency could be tested. ‘The APR.Intern program facilitated research which would have been difficult to conduct in private enterprise,’ said Leo Crasti, Director, Retaw. ‘The outcomes of this project have shown us that there is ample room to conduct further research. And as such we have engaged Cate and her team to find us another stellar intern,’ Leo concluded. Scott’s story is one of many that highlights the innovative and sustainable benefits of the program. APR.Intern allows Australian businesses to tackle their short-term research needs through its unique access to young Australian researchers, and their academic mentors. APR.Intern is a not-for-profit organisation funded by many Australian universities, government agencies and mathematical societies.